Reddit is an online community and social news platform in which users discuss and vote on other user submitted content. Reddit allows users to create small communities within the site called “Subreddits”. Native Advertising may sound like a foreign concept, but listen up because it’s on the rise. According to a June 2013 survey, 90% of US publishers either currently offer or are considering offer native advertising on their sites. What is earned media? Earned media is when a business tries to optimize on a targeted fans social circle. Instead of paying for traditional mass marketing, the business only initially pays and plans for a select group of people to actually see the advertisement or promotional event they implement. In today’s age twitter and Instagram are such powerful platform as it is insight into real time, real consumer thoughts and trends. Twitter is a social media network used to update users on a live basis. It is a great way to stay connected with current events, news sports, friends, and much more. Each post is 140 characters long and, as a result, users must keep their message succinct and to the point. 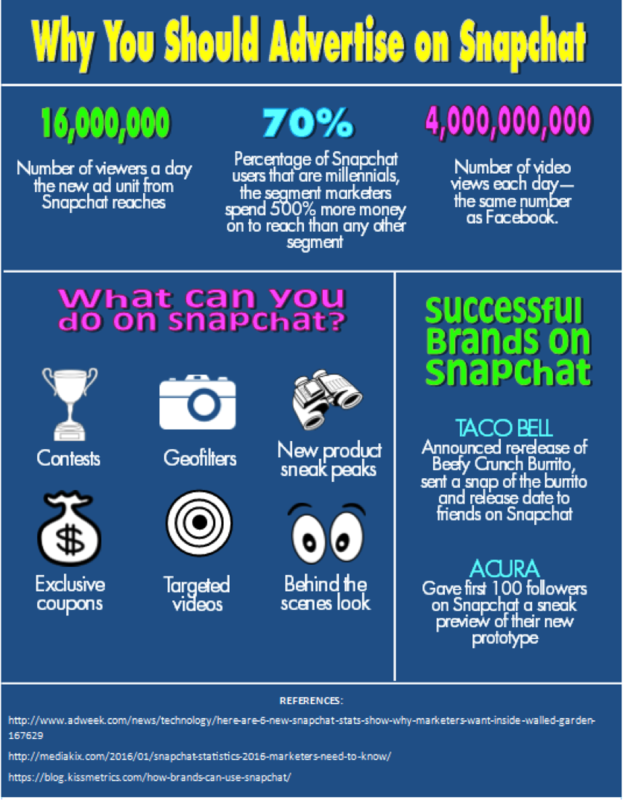 Check out this infographic about why you should advertise on snapchat! Social media is a powerful tactic for businesses and individuals to use to build and amplify their brand; however, there are downsides to this marketing tool. Businesses and individuals can post without thinking enough about the entirety of consequences that one post could have.